What we think affects how we feel. How we feel influences how we act, how we are in our relationships with others. And whether we speak of it or not, people pick up on our feeling and attitudes. Remember, most communication is not verbal. Look at the chart to the left. 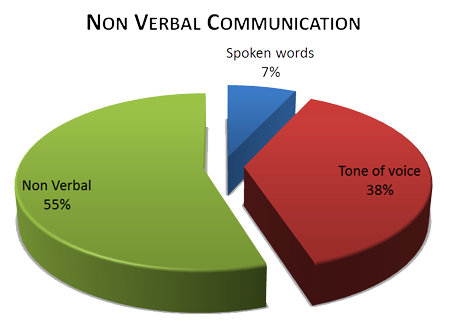 Some studies suggest that spoken words count for only 7% of received communication. One of the presentations I give to school librarians is on class management. It can be a challenge for teachers, but it is even truer for librarians. The library doesn’t have the natural structure of a classroom. We don’t see the same students every day. In middle and high schools we often don’t know the names of the students coming in. For the most part we don’t give grades, which removes one reason why students feel the need to pay attention. I remind participants that the presentation is called “classroom management” not “classroom control” and therein lies the difference. It’s a change of mindset. Control, whether in the classroom or by those seeking to censor books or ideas, comes from fear. When you feel threatened by or anxious about a situation, the natural response is to exercise some control over it. In a school setting, once you do that, you have lost the battle. Students recognize your fear or discomfort (it’s like animals – they can smell it), and take pleasure in increasingly unacceptable behavior. No one likes to be controlled. Most people don’t mind being managed. Management stems from confidence. Trust yourself and expect those you are interacting with to behave accordingly. For those still in control mode, this is easier said than done. The first step in making the change is to realize where you are triggering the situation. For example, when you are expecting a class with students you know are disruptive, what are you thinking as they are about to enter? Are you trying to figure out how to stop students from acting up or are you ready with strategies to distract them from it? Did you know that thinking of them as troublemakers only adds to the problem? One of the best things you can do is greet students at the door and them individually. Smile. Make a positive comment about something they are wearing or tell them you have a book you think they will like. 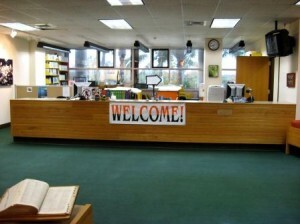 At the elementary school level it’s critical to have a structure students follow each time they come to the library. Have tasks for a few students to do, such as gathering the books being returned and stacking them on the circulation desk. Rotate assignments and be sure to give them to your “troublemakers.” Being in charge is likely to have them be on their best behavior. Have a plan for moving from book return to activity/lesson to book selection, and another one to bring the class to an end. Closing questions are a good idea. Walk them to the door and make positive comments. With a little practice, you can manage your attitude. When you do so, you won’t have to worry about “classroom control.” How have you managed your library? What works for you that you’d like to share with other? Comment below!